We worry about keeping our teeth bright and shiny, but what about their actual health? There are many habits that we do in our daily life that could be weakening our teeth. It is critical for your overall well-being that you address these issues. Also, make sure you are having your checkups. To schedule call the professionals at West Meade Dental. How do you drink your drink? Believe it or not, the way you drink your drink can affect your teeth. It is actually better to drink your drinks through a straw so it has less exposure to your teeth. Also, sipping them throughout the day only makes the sugar and acids more exposed to the teeth. And what do you do with the ice afterwards? Most people will chew their ice after they finish their drink. However, this should be avoided as it puts strain on the teeth and could cause fractures. Teeth are bones, not tools! Many people will use their teeth when they do not have another object around. Aside from this just being unsanitary, you can chip or fracture your tooth. Next time try using scissors, nail clippers, or pliers. Hey you! Stop grinding your teeth! Almost as annoying as smacking your gum, grinding your teeth cannot only put stress on your teeth, but the others around you. This is usually a nervous habit that is triggered by some sort of anxiety. If you grind your teeth at night, you should look into getting a mouth guard to wear while you sleep. What are you using to brush your teeth and how well are you doing it? Many think that a brush with harder bristles is the way to go. This can instead cause more sensitivity to the teeth, especially when roots begin to show. Every individual is different, so ask your dentist what type of brush will be best for you. Also, you want to make sure that you are brushing and flossing properly. You should be brushing at least twice a day and changing out your toothbrush in no longer than four months. For more information on proper brushing from the American Dental Hygienists’ Association, click here. Cavities are not the only cause of a toothache. Schedule an appointment with us to know what’s causing the pain. Most of us have experienced some type of toothache at some point in our lifetime, and the possible causes for the discomfort are numerous. At the first sign of tooth pain, many people immediately begin to fear that they have developed a cavity. It’s an understandable first impression, however, it’s also not uncommon for these same people to learn that their pain wasn’t coming from a cavity at all. A trip to the dentist is often the only way to get to the bottom of the problem. A basic understanding of your oral anatomy will help you to better understand the source(s) of a toothache. Your teeth are alive! They have nerves and a blood supply to keep them healthy. The outer layer of your teeth, the enamel, helps to protect everything on the inside of your tooth. 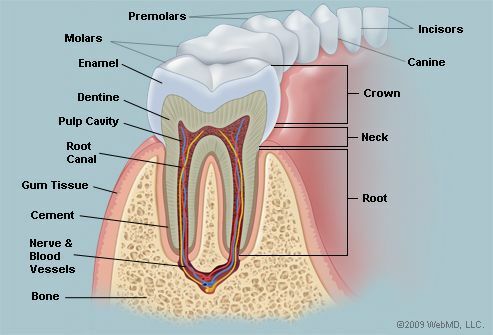 Directly underneath the enamel is the dentin, another hard layer that’s composed of microscopic tubes that communicate with the nerves inside your teeth. If these tubes become exposed, it can result in an increased sensitivity to heat, cold, sweets, and/or other stimuli. The pulp houses the tooth’s nerve and blood supply. If the nerve becomes inflamed, it can become extremely sensitive to temperature fluctuations. A cavity is the result of bacteria eroding holes through the enamel of a tooth, thereby exposing the dentin and/or pulp. Losing an old filling also exposes your tooth’s sensitive interior, which can cause discomfort as well. A dental abscess (infection) results in a build up of pressure around the root of your tooth, which can cause varying degrees of discomfort. Grinding your teeth can also cause toothaches by wearing away the enamel on your teeth and/or causing gum recession that can lead to irritation of the tissues around the teeth. Gingivitis and periodontal disease (gum disease) begins with bacterial growth in your mouth that can lead to destruction of the tissue that surrounds your teeth if not properly treated. Believe it or not, pain in your upper teeth can even be the direct result of a sinus infection. We hope that this information serves as a jumping-off point for you if you’re experiencing any sort of oral discomfort. It’s extremely important for everyone to note, however, that it is impossible to know the absolute cause of a toothache without paying a visit to a qualified dental professional. West Meade Dental will provide you with the comprehensive dental care necessary to keep you smiling confidently for years to come. Schedule an appointment to come and see us today!